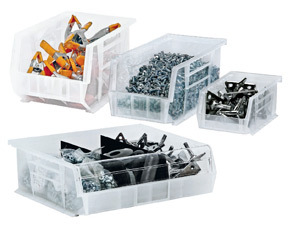 Clear bins are designed for 12", 18" and 24" deep shelving units or racks. Edges are reinforced for added strength. MUST ORDER IN CASE QUANTITIES AS SEEN IN THE QTY COLUMN. PRICING SEEN IS PER BIN. Economy 4"H Clear-View bins are made of tri-clear polypropylene. Designed to be tough and durable. Bins have a molded in label holder for the easy identification of individual bins. Clear-View bins make it easy to identify items stored in the bin. Bins are impervious to most chemicals. Built in rear hang-lock allows bin to tilt out. BR>A wide hopper front allows complete access to the contents of the bins. Designed for 12", 18" and 24" deep shelf units, racks or standard shelving. Allow 3-5 days to ship. 11-5/8 x 2-3/4 x 4"
11-5/8 x 4-1/8 x 4"
11-5/8 x 6-5/8 x 4"
11-5/8 x 8-3/8 x 4"
11-5/8 x 11-1/8 x 4"
17-7/8 x 4-1/8 x 4"
17-7/8 x 6-5/8 x 4"
17-7/8 x 8-3/8 x 4"
17-7/8 x 11-1/8 x 4"
23-5/8 x 4-1/8 x 4"
23-5/8 x 6-5/8 x 4"
23-5/8 x 8-3/8 x 4"
23-5/8 x 11-1/8 x 4"